It's not difficult to get a passport. If you don't have one yet, let's deal with that now. All countries issue these all important documents to their own citizens. You'll need to contact your government state department or equivalent. Citizens of all countries can check online or with local government offices for their national rules. Since we're US citizens, we'll go over the US rules here for obtaining a US passport. We have several pages of tips on this... check the Navigate Our Site box to the right for costs and passport cards etc. How to get a passport in a hurry. You can download application forms and directions and find out where you need to apply if you must apply in person or where to mail your application if you can renew by mail. Forms are also available at public offices like Post Offices, courthouses or municipal offices where passport applications are accepted. 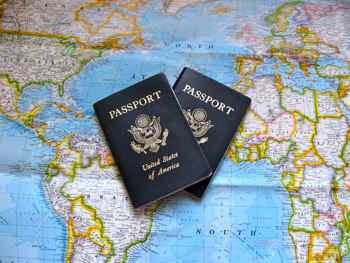 If you are applying for your first passport, you will also need proof of citizenship such as a certified birth certificate. Again, check the State Department website for details on what documentation you need. You'll also need one 2" x 2" photo for your passport application. You can get these from the corner drugstore or a professional photographers. You can even take your own if you do it properly. Though we hope you've got your passport tucked safely in your money belt and you will never need to use them for this! U.S. Passports for adults are good for 10 years. For children age 15 or younger, they are only good for 5 years. The U.S. is now issuing only Electronic-passports or E-passports. It looks the same as a traditional passport, but there is a small chip (an integrated circuit) embedded in the back cover which contains your passport information and state of the art identifiers. From now on when you apply for a new passport or passport renewal you will receive an E-passport. It may sound like a lot of information, but that's the government for you. Let's simplify it... to get a passport, get the application, fill it out, take it or mail it to the proper government office and in a few weeks, you'll have it. If you want to become a traveler.... just get a passport..... you're going to need one sooner or later.